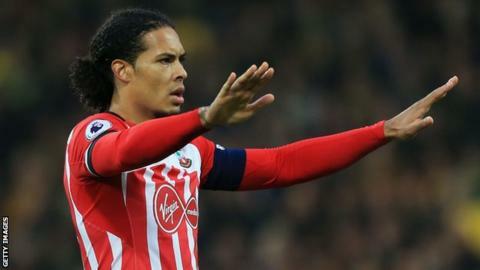 Southampton captain Virgil van Dijk is training alone and wants to leave the club, says manager Mauricio Pellegrino. Pellegrino has ordered the centre-back to train separately from the rest of the first-team squad because he feels the player is "not 100%" mentally. Van Dijk, 26, has been strongly linked with a move to Liverpool this summer, although the Anfield club said they ended their interest last month. The Saints remain adamant they will not sell the Netherlands international. "He is not involved with the team because psychologically he is not 100%," Pellegrino said. Speaking to BBC Radio Solent, the Argentine added: "When I was talking with him, the boy said that he is not available to play because he wants to leave. "I need to work with a player that works at 100% to defend Southampton. Pellegrino insisted his relationship with Van Dijk remains "excellent" and that he hopes the Dutchman will "review" his decision. "We need the player, but 100% - this is the question," the former Alaves boss added. "I want to help the squad, I want to help Virgil but we need a player, I repeat, involved in every training session, involved not just with the body but with the mind on the pitch with the rest of the players." Southampton start their Premier League campaign in four weeks' time at home to Swansea City at St Mary's.